The celebrations kicked off at Buckingham Palace during the changing of the guard where the Band of the Irish Guards played "Happy Birthday." The customary gun salutes by the British Army took place midday — "a 41 gun salute in Hyde Park, a 21 gun salute in Windsor Great Park and a 62 gun salute at the Tower of London," according to the Royal Household website, reports NPR. Despite the public fireworks, "The Queen usually spends her actual birthday privately," says the website. But the parties don't end this weekend. The queen often celebrates two birthdays, one in June and another on her actual birthday, April 21. It's a tradition that dates back to King George II in 1748 reports the BBC. King George, who had aspirations for a public celebration, instead marked his November birthday when he could ensure fairer England weather. "[H]e decided to combine it with an annual military parade in the summer," the news outlet says. 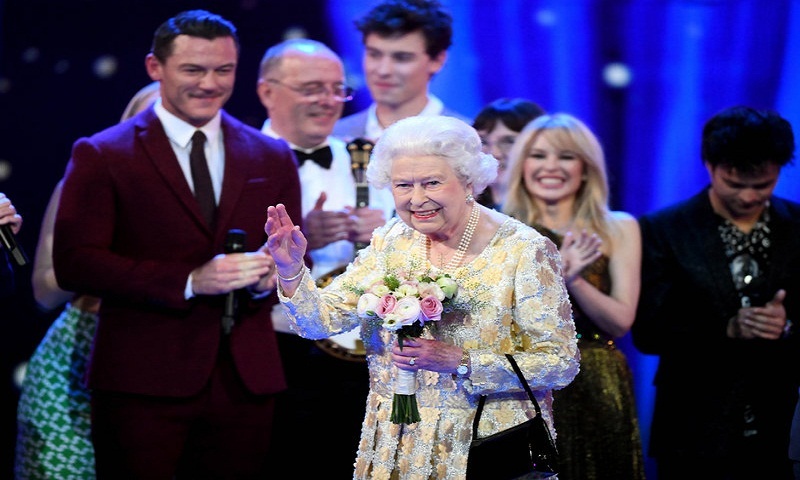 On Saturday, Queen Elizabeth, joined by other members of the royal family, attended "The Queen's Birthday Party," a concert at London's Royal Albert Hall. An eclectic ensemble performed in her honor, including Tom Jones, Sting, Kylie Minogue, Ladysmith Black Mambazo and other stars from across the Commonwealth. The concert proceeds will benefit The Queen's Commonwealth Trust, a new youth charity of which the queen is patron. In a speech at the event, Prince Harry wished his grandmother a happy birthday, and announced the official launch of her charity. "This organisation, in your name, will provide a platform for those working to make a difference in their communities across 53 countries. Happy Birthday Your Majesty," he said. The queen became the longest-reigning living monarch after the death of Thailand's King Bhumibol Adulyadej. This year, her official birthday is set for Saturday, June 9, according to the Household Division's website, and will be celebrated with a Trooping the Colour parade in London.